I am all about healing, growth, happiness. There are many ways to heal your life, many ways to discover who you are and express that which deals with both growth and happiness. As a practicing energy therapist/teacher who also carries a Diploma in Clinical Hypnotherapy achieved at the New Zealand School of Hypnosis I find myself in a unique position to be able to offer skills to those seeking them either in the form of therapy or information. I love seeing and reading Auras and moved well away from attunement based teaching to encompass a brand new multi- vibrational modality. at which point founding the Vibrational Expansion Technique® of energy therapy. You are an amazing complete being of messy, beautiful, chaotic energy along with cohesive moments of absolute brilliance and all are reflected in your energy at all times. 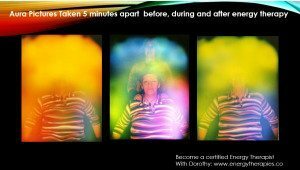 Initially when I started doing aura pictures a camera was needed, but went on to learn how to show others how amazing they look in real motion, my main motivation was for my clients to see the brilliance that I saw. It was surprising and wonderful to see how teenagers just loved having aura readings with the unexpected result in confidence, calmness and even behaviour changes simply because I could put into words, feelings and emotional responses that they did not yet understand. As I went on it became clear that seeing into the body, the past and the future were all wrapped up in the same energy emitted from others, it would flair when information was given and change (superficially) when they asked or answered a question. I love love love it. That is just a smidgen about me (aren’t they peanut butter filled chocolates?) If I waxed a little lyrical there it is certainly something I can do, be warned though, I am not your friend or your mother, so any consultation will include my professional skills which allow me to go to bat on behalf of your inner voice which must be heard if you are in a conflicted moment or lifestyle. If you want to grow I can help, if you want to learn I can help, if you need information to make good choices I can help. if you are looking for an enabler, I am not your girl.